Washington — Reflecting a deeply divided political landscape, results were decidedly mixed on the wide range of oil, natural gas and power issues at play in the raucous and sharp-edged US midterm elections, which came to a head Tuesday. Split control of the House and Senate likely will stymie legislative initiatives over the next two years, but a Democratic majority in the House may well lead to increased scrutiny and pushback for President Donald Trump's regulatory rollback efforts. Significantly, House Minority Leader Nancy Pelosi has already signaled that Democrats will give more air time to climate change in the new Congress. She said she would urge her caucus to revive a select committee on the subject to prepare the way for energy conservation and climate change mitigation legislation. Republicans won Senate races in Texas and North Dakota, the top two oil-producing states in the country, while a Democrat expected to favor stricter drilling regulations won the governor's race in New Mexico, the number three oil-producing state. Voters delivered mixed results for renewable energy-related initiatives and gubernatorial candidates who backed ambitious clean energy goals. Among the Democratic governorship pickups along those lines were Illinois' J.B. Pritzker, Colorado's Jared Polis, Michigan's Gretchen Whitmer and New Mexico's Michelle Lujan Grisham, while Republicans less inclined toward such goals prevailed in Ohio and Florida. "The strong Republican showing in the Senate suggests that a green agenda will face headwinds at the federal level for a while to come, even as Democratic pickups of state houses suggest that more states will become active in this space," observed Roman Kramarchuk of S&P Global Platts Analytics. Overview: House flip could bolster oversight of Trump regulatory rollbacks. Result: At press time, the count stood at 222 Democrats to 197 Republicans. Energy impact: Democrats regained control of the House, returning split government to Washington and opening the door to aggressive oversight of Trump's deregulatory agenda. Oversight targets could include efforts to speed energy infrastructure permitting, tariff policies, rollbacks of climate change regulations, oil and gas drilling initiatives, and support for coal and nuclear generation. Individual companies could also be probed. With the 2020 election now in sight, Democrats will have a platform to highlight their energy policy agenda. House Minority Leader Nancy Pelosi has voiced interest in highlighting climate change by reviving a select committee on climate, as a prelude to legislation on energy conservation and climate change. The defeat of multiple vulnerable moderates, like Representative Carlos Curbelo of Florida, co-chair of the Climate Solutions Caucus, could make work across the aisle on energy issues harder. Divided government complicates the path for legislation, though Pelosi has flagged infrastructure as one area of common ground. 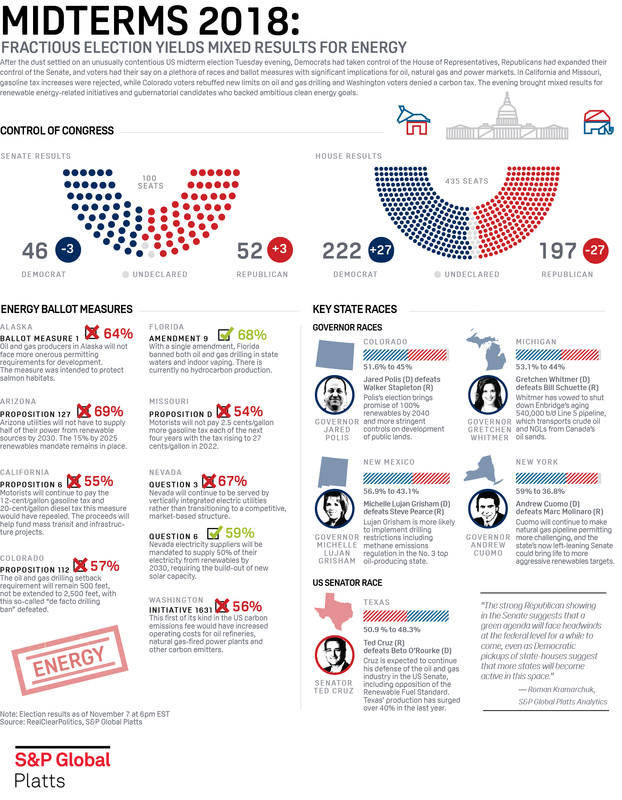 Overview: Republicans hold majority, maintaining path for nominees. Result: At press time,Republicans 52, Democrats 46. Energy impact: Republicans held the US Senate majority, keeping in place Trump's ability to push forward confirmation of judges and agency officials favorably disposed to his energy policies and regulatory-rollback agenda. Waiting in the wings is Bernard McNamee, nominated to fill the crucial fifth slot at the US Federal Energy Regulatory Commission. Having a third Republican could help push contested natural gas projects over the hump. His vote could also be key if the Department of Energy revives efforts to support at-risk coal and nuclear generators. Energy policy has been a bipartisan affair in the Senate Energy and Natural Resources Committee, under Chairman Lisa Murkowksi, Republican-Alaska, and Ranking Member Maria Cantwell, Democrat-Washington. The pair is expected to continue work on modest legislation. But that would need to be hammered out with a greener House under Democratic control. Bipartisanship lost some ground with the defeat of moderates, including Heidi Heidkamp of North Dakota. Overview: US Representatives Michelle Lujan Grisham, Democrat, and Steve Pearce, Republican, campaigned to replace term-limited Republican Governor Susana Martinez. Result: Lujan Grisham defeated Pearce with 57% of the vote. Energy impact: Grisham brings a potentially tougher regulatory climate for drillers in the country's third top oil-producing state. She is seen as more likely to embrace drilling regulations, such as limits to methane emissions, but her reach is limited as governor, given that a large share of the state's producing oil and natural gas leases are on federal land. Lujan Grisham has also vowed to move "aggressively" to promote renewable energy such as solar and wind, which could mean new generation investment opportunities for the state's vertically integrated utilities. She will replace Martinez, who oversaw a deregulatory push for the state's energy sector. New Mexico has faced similar pipeline takeaway constraints as Texas, where natural gas flaring also has surged in order to keep oil wells producing. The state pumped 724,000 b/d of oil in August, an 8% increase from July, according to the latest Energy Information Administration data. Pearce has fought federal methane regulations in Congress and said they were putting the state's small producers out of business. Overview: Democratic Governor Andrew Cuomo successfully defended against Republican Marc Molinaro. The state Senate flipped, boosting prospects for renewables targets. Result: Cuomo prevailed 59% to 36.8% with 99.4% reporting; Democrats won 35 Senate seats to Republicans 21. At press time, pending races pointed toward further Democratic gains, according to The New York Times. Energy impact: The combination of Cuomo and Democratic control of the state Senate could revive ambitious renewable energy legislation. Proponents are keen on getting a floor vote, adding pressure for Cuomo to come on board. The Climate and Community Protection Act seeks to eliminate greenhouse gas emissions from human-caused sources economy-wide by 2050. State agencies would apply a climate test to permitting. The bill previously passed the state Assembly three times but idled in the Republican-controlled Senate. While Cuomo may seek to match California's targets as he toys with a presidential run, industry advocates suggest he will need gas-fired generation to meet existing renewable targets. Reflecting the pressures on Cuomo, a coalition of environmental groups and others this week urged the governor to take further steps to follow through on his pledge to accelerate energy efficiency gains. Overview: Former Democratic state senator Gretchen Whitmer faced off against Republican Bill Schuette, Republican. Result: Whitmer defeated Schuette with 53% of the vote. Energy impact: Michigan's next governor may push to shut Enbridge's 540,000 b/d Line 5 pipeline, an aging system that remains a key route for Canadian crude and NGLs to the US Midwest and Ontario. Whitmer has promised to dismantle an agreement reached in October between the state's term-limited governor and Enbridge to build a utility corridor under the Great Lakes' Straits of Mackinac. The tunnel would address environmental safety concerns surrounding the 65-year-old Line 5 and house a future replacement. Canadian pipeline capacity is so constrained that losing any throughput would exacerbate the discount to US prices at which Alberta producers must sell their oil, according to S&P Global Platts Analytics. An Enbridge spokesman said the company would continue to work with "elected officials and policymakers at the local, state and federal levels, to ensure necessary investments in critical energy infrastructure will continue to drive economic growth and job creation -- safely, reliably and efficiently -- across the 41 states in which we operate." Whitmer also campaigned on setting a goal of 100% renewable energy for Michigan. "We need to evaluate Michigan's energy needs and how much Michigan really benefits from [Line 5] versus Canada," Whitmer's clean water for Michigan plan reads. Michigan Public Utility Commissioners serve staggered six-year terms. Whitmer will be appointing one in 2019 and one in 2021. Overview: US Congressman Jared Polis, Democrat, faced Colorado's treasurer, Republican Walker Stapleton. Result: Polis defeated Stapleton with 52% of the vote. Energy impact: Polis' energy position is underpinned by his campaign promise of 100% renewable electricity by 2040, which would mean a significant build out of new capacity from the state's current renewable supply level of around 15% this summer. The ambitious goal could be a boon to both renewables and storage developers. Leading up to the election, Polis pointed to claims that the cost of utility-scale wind is cheaper than gas, and argued that energy storage could improve the cost benefits of a fully renewable system. He advocates a long-term Production Tax Credit to ease the transition to higher levels of renewable generation. He has noted Colorado's vested economic interest in preventing further climate change. Utilities in the state are already pursuing more renewables. Xcel Energy is planning to procure new wind, solar and battery resources and expects to achieve nearly 55% renewable energy by 2026. Overview: In one of the highest-profile races of the Midterms, Senator Ted Cruz edged Democrat Beto O'Rourke. Result: Cruz narrowly re-elected with 51% of the vote. Energy impact: Texas voted to keep Cruz, one of the oil industry's top defenders in the US Senate. He has been one of the loudest voices in Washington for reforming the Renewable Fuel Standard, although the White House discarded his proposal to cap Renewable Identification Numbers at 10 cents. During a nearly two-year fight over the issue, Cruz rallied Northeast oil refinery workers, complaining that the biofuel policy is putting the facilities out of business and threatening regional energy security. Trump sided with ethanol interests in October, directing EPA to approve year-round sales of higher-ethanol blends, although Trump asked for new rules for RINs trading as a concession to refiners. Texas refineries can process 5.7 million b/d of crude. The state pumped 4.58 million b/d of oil in August, putting it on track to overtake OPEC's second-top producer, Iraq. Texas output has surged nearly 40% in the past year despite pipeline constraints that are expected to persist into next year. President Donald Trump touted Texas' energy abundance during a rally for Cruz in Houston last month. "With Texas leading the way, think of this one, the United States is now -- this happened over the last very short period of time -- the largest producer of crude oil and natural gas anywhere in the world," Trump said. Overview: State commissioners running, seen as key to Keystone XL. Result: Republican Dan Watermeier elected by 51%, and Tim Schram re-elected by 62%. Energy impact: TransCanada's 830,000 b/d Keystone XL heavy oil pipeline likely got a boost from Tuesday's election of two supporters to the state PSC, which voted 3-2 in November 2017 to approve the company's mainline alternative route through the state. Watermeier supports the project and defeated Christa Yoakum, who had promised to challenge the pipeline approval. Schram was one of the three commissioners who voted to approve it. The state Supreme Court is reviewing the decision. "The outcome of the Supreme Court proceeding on the approved alternate KXL route may send the question of approval for KXL back to the PSC, where approval looks likely," research firm Washington Analysis said in a note Wednesday. Keystone XL is one of three remaining proposals for new takeaway capacity that Alberta oil sands producers are still counting on to shrink a record discount for their crude, along with Canada's newly government-owned 590,000 b/d Trans Mountain pipeline expansion to British Columbia, and a 370,000 b/d expansion of Enbridge's Line 3 into the US Midwest. Western Canadian Select at Hardisty was assessed Tuesday at a $42/b discount to WTI, after trading at a record wide discount of $51.50/b on October 11. Overview: Passage would have increased oil and gas drilling setbacks on non-federal land from 500 feet to 2,500 feet. Result: Colorado voters rejected the measure by a vote of 56.7% to 43.2%, or 1,084,688 to 826,083, according to Colorado Secretary of State's office. Energy impact: If the proposition had passed, it would have significantly reduced oil and gas production on state land, according to the Colorado Oil and Gas Conservation Commission. Surface area available for drilling would have plummeted by 78% in Weld County, the core of the Denver-Julesburg Basin, and 85% across the state. Oil and gas industry supporters worried the setbacks would have crippled an industry that employs nearly 30,000 people directly and contributes $31.4 billion to the state's economy each year. The state ranks sixth in the US in volumes of oil and gas produced per year. If the proposition had passed, DJ oil production would have sunk to 275,000 b/d by 2023, a 54% decline from current projections, and natural gas output would have dipped to 1.9 Bcf/d by 2023, down 45% from the current outlook, S&P Global Platts Analytics estimated. With no setback measure in place, DJ Basin oil out should climb to nearly 600,000 b/d by 2024, Platts Analytics added. "This measure was an extreme proposal that would have had devastating impacts across the state on jobs, education and numerous other programs important to each of us," said Chip Rimer, senior vice president at Noble Energy, one of the top producers in Colorado. Overview: The proposal would have strengthened permitting regulations for any activity, including oil and gas drilling, that could affect salmon habitat. Result: The measure failed, with 64% of the vote against. Energy impact: If it had passed, the measure would have installed new requirements and a new permitting process for any activities near bodies of water that could affect anadromous fish, including salmon and steelhead trout. Companies engaged in oil and gas production said the additional rules were unneeded and could delay projects and increase costs. The group "Stand for Alaska," which opposed the measure, raised about $11 million to defeat it. Producers were concerned it could prohibit industry developments on the North Slope and elsewhere in the state. The Alaska Power Association also came out against the measure, saying it could place future hydroelectric power projects at risk. It's hard to gauge how much the measure would have affected oil and gas production in the state, which has been in decline. Oil production in Alaska has been on a downward slope for most of the past decade. After averaging more than 700,000 b/d in 2007, it has averaged around 460,000 b/d in 2018, according to Platts Analytics. Total rig count in the state is currently at 5 and hasn't topped 10 since 2016. Platts Analytics does not track Alaskan natural gas production as it is so minimal. Overview: California voted to reject a proposition that would have repealed a recent 12-cent/gallon gasoline tax increase and prevented state lawmakers from increasing gas taxes in the future without voter approval. Result: The proposition was rejected with more than 55% of the vote. Energy impact: California is the most populous state in the US and consumes roughly 43 million gallons of gasoline every day. The 12-cent/gallon increase in the gas tax, along with a 20-cent/gallon diesel fuel tax, went into effect on November 1 and had no noticeable impact on demand. Kevin Book, managing director with ClearView Energy Partners, said Wednesday that the tax increase was "well within typical seasonal variability for California drivers," and not viewed as having a significant impact on fuel costs. "California has high gasoline prices, but also relatively low energy spending as a share of per capital disposable personal income," Book said. "California may have a storied history of open roads and drive-thru culture, but most voters live today in dense urban areas, which skews gasoline exposure to the downside." Overview: Florida voters approved a state constitutional amendment which prohibits drilling in all state waters along Florida's shoreline. Result: The amendment, which required a 60% supermajority vote for approval, passed with more than 68% of the vote. Energy impact: The amendment will have no impact on supply since no drilling currently takes place in state waters, but it does prohibit future development. The amendment will prohibit drilling in submerged lands 10.36 statutory miles off Florida's Gulf coast and 3 nautical miles off the east coast. The amendment will not impact the transportation of oil, refined products or LNG through state waters by pipeline or ship, nor possible future drilling in federal waters. Overview: The measure would have set a carbon fee of $15/mt starting in 2020, increasing by $2/mt annually until the state met its existing greenhouse gas reduction goal for 2035 and was on track to meet its 2050 goal. Result: The measure was rejected by 56% of the vote. Energy impact: Washington state voters rejected Initiative 1631, which would have raised costs for oil refineries, natural gas-fired power plants and other large users of fossil fuels. It would have been the first carbon fee in the US and, if passed, was predicted to spur similar efforts to curb emissions in other states. Washington rejected a similar carbon tax in 2016 by a similar margin. It was estimated to generate $2.3 billion in revenue in the first five years. Washington state is home to 3.4% of US oil refining capacity: BP West Coast Products' 227,000 b/d Ferndale plant, Shell Oil Products' 145,000 b/d Anacortes plant, Phillips 66's 105,000 b/d Ferndale plant, Andeavor's 120,000 b/d Anacortes plant, and US Oil & Refining's 40,700 b/d Tacoma plant. The fee would not have applied to the state's sole coal-fired power plant, which is already required to close by 2025. Overview: The proposition would have increased Arizona's renewable portfolio standard to require electric utilities to obtain 50% of their electricity from renewables by 2030, up from the current mandate for 15% by 2025. Result: The proposition failed, with 69% voting against it. Energy impact: The outcome could mean a new lease on life for the 3.9 GW Palo Verde nuclear plant, which Arizona Public Service had warned could retire early under the measure. APS said the initiative could have flooded the grid with solar power in the middle of the day when demand is low, requiring reduced output from baseload plants and creating operational and economic challenges for Palo Verde. But advocates said the nuclear plant would stay open amid expanded renewables and claimed the initiative would take advantage of the state's abundant sunshine. The outcome could be a missed opportunity for solar developers in the Arizona, which has one of the largest solar energy potentials of any state. Overview: The measure would have amended the state constitution to require Nevada to transition away from its vertically integrated utility system to a competitive, market-based structure. Result: The question failed, with 67% voting against it and 33% voting for it. Energy impact: The outcome could be a boost for renewable energy because NV Energy had said it would cancel its plans to invest in 1 GW of renewables if the measure had passed. In the wake of the election, NV Energy said it remains focused on its promise to double renewable energy by 2023 while keeping rates low. Advocates said the initiative would have driven prices down and provided more renewable energy choices. The measure, if it had succeeded, would have spelled big changes for Nevada's energy picture. For instance, NV Energy likely would have been forced to divest its generating assets and Nevada could have joined an existing grid operator, presumably California Independent System Operator. Overview: The measure will increase Nevada's renewable portfolio standard to require utilities to obtain 50% of their electricity from renewable resources by 2030, up from the current mandate of 25% by 2025. Result: The question passed, carrying 60% of the vote. Energy impact: NV Energy was neutral on the question and it plans to double its renewable energy by 2023. Question 6 was one of several state-level RPS efforts backed by billionaire Tom Steyer's nonprofit NextGen Climate Action. The Nevada results show that "Americans in purple states support clean energy overwhelmingly," Steyer said at an event in Washington, DC, Wednesday. As a constitutional amendment, the measure needs to be approved by voters twice, so it would need to pass again in 2020 to go into effect. Overview: Missouri voters rejected an increase of 10 cents/gal in the state's gasoline tax. Result: The proposition was rejected by nearly 54% of the vote. Energy impact: The proposition would have raised the state's gasoline tax from 17 cents/gal to 27 cents/gal over four years. Missouri voters have previously defeated five proposed gas tax increases and approved three, including the state's initial 2 cents/gal gas tax in 1924. Missouri voters are reluctant to approve gasoline tax increases due the relatively high amount of disposable personal income spent on gasoline, compared to drivers in California, where voters rejected the repeal of a recent gas tax hike. The average Missourian spends about 3.2% of disposable income on gasoline, compared to 2.6% for the average Californian, according to Kevin Book, managing director with ClearView Energy Partners. "Missouri drivers go longer distances on lower incomes, which means they feel gasoline taxes more," Book said.